M1 Finance Review-Completely Free Automated Investing! This content may contain affiliate links through which we are compensated when you click on or are approved for offers from our partners. See our disclosures for more info. It’s no secret that investing is complicated. So anytime it can be made easier, folks get pretty excited. 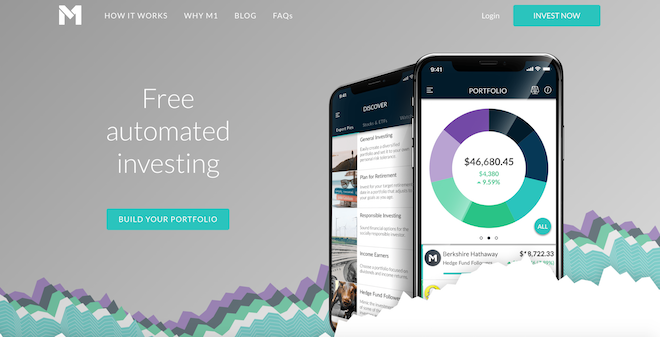 That’s why there’s been a lot of hype about M1 Finance, a completely free automated investing robo-advisor brokerage hybrid. Today, I’ll take a closer look at all that M1 has to offer. What I was trying to do seemed relatively basic. I wanted to be able to pick my investments, and have recurring deposits automatically added to those allocations. I hated the idea of idle cash, so I wanted a platform that put all my dollars to work. Unfortunately, the seemingly simple solution just didn’t exist. 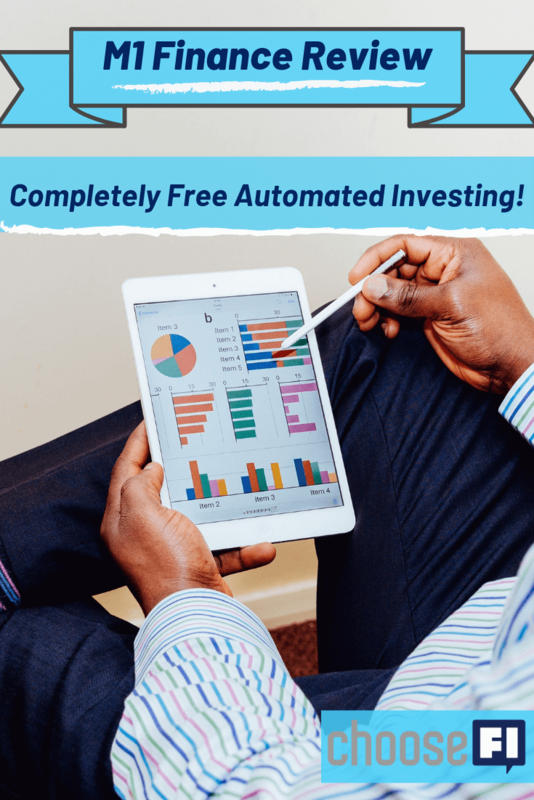 So he created it–a totally free (more on that later), robo-advisor brokerage that lets investors manage their money through automated investing. Why is this so revolutionary? Well, let’s dive into the details of M1 Finance to find out. M1 offers ETFs and stocks through three major exchanges: NYSE, NASDAQ, and BATS. Sure, this sounds like every other trading site, but, thanks to the site’s innovative design, it’s not. When you first invest, you start by making a “pie” where each investment you choose makes up a slice. You then set up the target weight of each slice. 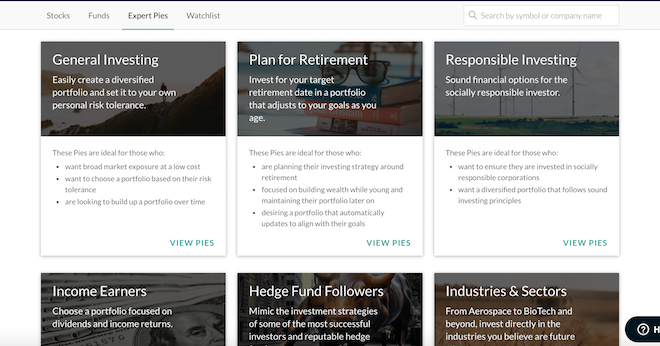 Or, you can choose from already made pies that professional investors have designed. Now all you have to do is add money to your account and M1 assigns the money to each investment based on your asset allocation. That’s it. You can add, remove, or edit these “slices” whenever you’d like. You can keep track of your investments on M1's easy to use app. Perhaps the best feature of M1 Finance is that it’s completely free for investors! No really, it is. Part of M1’s mission is to offer commission-free investing. There are also no maintenance fees on your account, so every penny you put in is fully invested. You do have to have at least $100 in your account to invest, but that's nothing compared to similar services that require thousands. M1 Finance does this by allowing you to buy fractional shares of ETFs, which is one of Jonathan’s favorite things about M1. Along with ETF and stock options, you can open a retirement account. M1 Finance supports Traditional, Roth, and SEP IRAs. You can also open a Trust, LLC, or Corporate investment account. You must have a minimum of $5,000 to open an LLC account. Create your own portfolio or choose from one made by professionals–making M1 great for newcomers and investment veterans alike. You can't access mutual funds, so you will not be able to get VTSAX on this platform. But one of the problems with the VTSAX has always been that you have to get a $10,000 minimum in order to buy into it. While this may be a problem for seasoned investors, for anyone who can’t come up with the $10,000 minimum to invest, M1 Finance is still a perfect fit. One other aspect of M1 Finance that may be an issue for some is that you can only see the assets you have with them. There’s no way to track all your accounts in different places, like you can with management sites like Personal Capital. While this can be annoying, it shouldn’t sway you against M1. Luckily, you can use Personal Capital to manage all your accounts, including M1 Finance. So, using Jonathan’s suggestion, you can use Personal Capital as your dashboard, while still having the easy to use M1 Finance app for your accounts solely based with them. How does M1 Finance make money? Who should use M1 Finance? So, now that I’ve highlighted the good and bad, you’re probably wondering: Should I use M1 Finance? The short answer is yes! Jonathan agrees with the founder, Brian, that M1 Finance solves so many problems for so many people. It’s simple, straightforward, and truly free investing. But, it's not for everyone. For beginning investors that don't feel comfortable leaving their portfolios solely up to the professionals that create select “pies,” additional research may be required before investing with M1 Finance. After all, it's meant for self-driven investors who want to choose their own investments initially. It's also not best for traders. M1 investments are meant to be long-term buy and hold investments. M1 Finance is best for investors who want to control what they invest in, but want the nitty gritty, everyday details left to someone else. Jonathan & Brad explore the world of Financial Independence. They discuss reducing expenses, crushing debt, building passive income streams through online businesses and real estate. How to pay off debt, Crush your grocery bill and travel the world for free. Every episode is packed with content and actionable tips and no topic is too big or small as long as it speeds up the process of reaching financial independence. Nice write up. I recently signed up for M1 and very impressed with their interface. It should be noted that while while VTSAX, as a mutual fund might not be able to be available for purchase through M1, that you CAN purchase the ETF equivalent which is VTI. There’s an argument to be made that VTI actually could be considered better in a taxable account since there won’t be any taxable capital gain distributions as in the mutual fund version of the holding. M1, can truly automate it for anyone that wants to create the class 3 fund portfolio of VTI, VXUS, and BND. This seems like a great way to invest if you’re into robo-investors. I think the main reason someone would choose this service, or Vangaurd, over one like Betterment is if they had a windfall of cash to use. I like Betterment and similar services because of their ability to start with absolutely 0 dollars and make deposits as low as $10 at a time. I definitely heard about M1 Finance from one of the ChooseFi podcast episodes but can’t seem to find it. Can anyone please direct me to it if you recall which one it was?